The Eloquent Orifice was born out of a collective effort of various individuals involved in the publishing, academic and arts industries. The driving force behind the work we do at EO is our belief that no voice should be deemed too insignificant or too different to be worth hearing. We operate within an all-inclusive framework, publishing works of merit, regardless of the creator’s renown, nationality, origin, sexual orientation or age. We founded EO with the overarching altruistic desire to bring the arts to the masses, to make them accessible, and to encourage creative expression. Through the publication of this journal, we aim to provide a platform for the encouragement of further intellectual interaction among contemporaries. About the name of the journal. 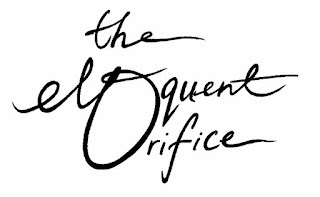 The name for our literary journal, The Eloquent Orifice, came about in a brainstorming session with friends. It was actually Sean Lai who came up with it. The idea was to be an "eloquent orifice", a space open to influx and open for output. A place of exchange, an exchange of ideas. To give voice to the unheard. To hear the unheard. The space Eloquent Orifice occupies within the Singapore literary field. We were hoping to forge a balanced space between the critical and creative. However, we seek to focus on not just the print medium, but also on other creative works, such as film, music, photography etc. Also, we are not just limited to Singaporean works, but works from all over the world. About the types of work EO looks for; the contributors, the readers. We accept submissions in the following categories: critical essays, visual arts, music, literary works, commentaries, reviews. See here for more information. Stephen Fernandez, a published Singaporean academic based in Canada — published a critical essay with EO. Peter Bakowski, a published Australian poet based in Melbourne — published poems with EO. Eric Valles, a published Filipino poet based in Singapore — published poems with EO. Rodrigo Dela Pena, Jr, a published Filipino poet based in Singapore — published poems with EO. Samantha Ann Francis, a published Singaporean photographer and writer — published photo series with EO. Our readers hail from many different countries and backgrounds, so it's hard to say who our readers are exactly. Challenges and opportunities for literary journals in Singapore. Hmm, challenges and opportunities in Singapore nowadays...? Tough one. Challenges: Lack of funding. Lack of manpower. Lack of visibility. Difficulty in penetrating the market if not established by persons of renown or endorsed by other established writers, artists or publishers. Opportunities: Untapped potential waiting for us to discover. Thanks to Geraldine Tan and Crispin Rodrigues for their responses. Future installments of this series will continue exploring Singapore’s online literary magazines.